Jerry and I don't usually do much of anything on the fourth of July, but my parents decided to have a party this year. I was really happy that Jerry was off work today. He's been working so much lately! Today on the schedule was the same as last week: 15 minutes easy, then four repeats of (5 minutes tempo + 2 minutes easy), and ending with a 10 minute cool down--a grand total of 53 minutes. I turned on the Season 10 finale show of TBL and started running. I've noticed that my "easy" pace is feeling easier each time I run... which is awesome, because it means I'm probably getting faster. I'm curious to see what my pace would be outside in ideal conditions (today it reached over 100 degrees, so I am perfectly content running in the air conditioning). 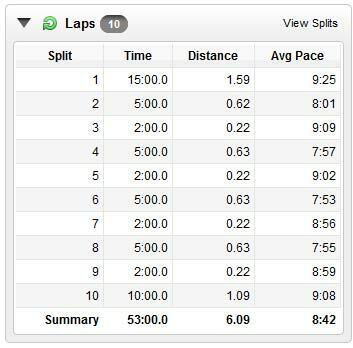 I know that my outdoor pace is not going to be this fast, but I feel like I'm getting back to where I was before I started marathon training. Jerry is working Friday, so unless my mom can watch my boys in the morning, I'll have to do 10 miles on the treadmill. I'm learning to like the treadmill, but 10 miles on it will be tough. Anyway, I felt awesome after running, and I was dripping with sweat. I took a shower and got ready for the party. I ate lunch before I left, so that I could hopefully avoid the food at the party until dinner time. For lunch, I wanted something cold, so I had a cup of fruit salad (that I made for the party) topped with Kashi GoLean Crunch and almond butter. It was a really good, light lunch. There is fruit under there, I promise! I asked my mom what she planned on doing for food at the party, so I could plan out in advance what I was going to eat. Everyone was going to bring a dish, and my mom had brats to cook on the grill. I brought the fruit salad I made and a vegetarian hot dog to throw on the grill. I was really surprised at how good the veggie dog was--I wasn't expecting it to taste very good. With the ketchup, mustard, and onions on it, I wouldn't have really known the difference. I ate two cups of the fruit salad, and avoided all other food. My aunt made cake pops, and they were tempting me the whole afternoon. I finally decided to eat one, and just estimate the calories in it. I guessed about 200 calories. It was delicious, and worth every calorie! Then it was very tempting to go back for another, but I restrained myself. It was extremely hot all afternoon. I wore my favorite green sundress (the one that many of you complimented on my Michelob cider review). I actually got that dress for $2 a Goodwill. I love it! But I felt so sticky and gross (there was 100% humidity today). I sat outside under an umbrella and chatted with people. It's kind of interesting--when I was obese, I despised the heat. I would have stayed indoors in the air conditioning the entire time and complained about the heat along with everyone else. But ever since losing the weight, the heat doesn't bother me that much. I felt so "normal" sitting outside on the fourth of July at a picnic, wearing a sundress ;) Sounds cheesy, I know. My aunt kept asking me if I wanted to bring home some cake pops "for the kids", but I just couldn't do it. I knew my kids wouldn't get a single one of them if they were in my house (I would eat them all), so I declined. I still have about 300 calories left today, so I'll probably have a couple of glasses of wine tonight. I'm glad that I stuck to my guns at the party, even with the cake pop! Sounds like you did a great job and had a nice 4th of July! It's nice when you can celebrate without gaining weight. Weird about the heat thing, right? I hated the heat until I lost 100 pounds, and now, even though I love me some Michigan through and through, I look at real estate in Dallas ALL THE TIME because the weather looks amazing. A little cake pop won't hurt anyone! But i know how when you're trying to be good about dieting, even a small slipup can bring you down a little. This is my 2nd 4th of July I've missed because I'm living in Japan, and it's one of my favorite holidays! I'm proud to be American and love to celebrate with the 3 F's- family food and fireworks! And don't get me started on how much better the heat is weighing a little less! Sure I'm still hot and I still stick to chairs in shorts a bit, but maybe because I have fewer rolls for the sweat to leak out of or I'm more comfortable all around- standing my feet hurt less, sitting I don't feel quite so blobby. Enjoy your 4th! What a fantastic way to spend your leftover 300 calories!! Have you tried any of Jillians workout dvds? It feels like she is in the room with you, so fun! Woohoo, that is awesome that you're getting faster with your running! Excellent work of balance/exercise and being treated today. I know it sounds silly but I LIVE for these days. When I go somewhere, stick to the plan, but still feel like I've had an in-control treat (like the cake pop.) Starting the day like you did with exercise is pretty great too. Cheers Katie. It's so awesome. So impressive, Katie! I wish I could run on a treadmill. I have tried it many times throughout my training but I get so dizzy and wobbly feeling that I have to hold onto the rails and then I don't feel like that's a good running stance at all. I am SO impressed that you stuck to your guns re: food, especially on such a tempting day. You go, girl! Way to give us all things to think about as we navigate through our own days of temptations! There's a show called Our Big Fat Weight Loss Story that I love to watch when I work out at home. Usually I mute it and read the closed captioning, while I listen to music. It's on the Style Network, and I don't know if it is available elsewhere, but it is a good show if you can find it. I'm the same way with the heat--it bothers me way less now. However, in the winter, I'm always COLD! I'm glad the treadmill is working out for your running without knee pain. And also jealous if you for forgoing most of the treats at the party yesterday. I ate JUNK all day. Never anything that was good for me, other than some fresh veggies with diet Ranch dip. Other than that it was Chex mix, sweet Chex mix, a piece of cherry pie and one little (sorta) piece of that biscoff cheesecake (YUMMY)!, little sausages wrapped in bacon and smeared in barbecue sauce, oh and lots of shrimp in cocktail sauce. The shrimp wasn't too bad calorie wise. I never ate a burger or brat. I did have some barbecued pulled pork (sans bun), and some baked beans. The scale showed a 2-lb. gain this morning. I'm trying to get back on it today, but there's sure a lot of tempting left-overs sitting around my house. Can't wait til they're gone. Someone brought sliced apples, which were very healthy, but then they made Snicker salad to dip the apples in, which was definitely NOT healthy. They left the Snicker salad here when they went home, and I probably could have saved it, even though it sat most all day long. But I tossed it--too tempting! You look really nice in that green sundress. Nice to find such good deals....and look good in them too. Ha! I just had the most brilliant idea from reading your post. Someone who is crafty at film editing should put piece together half hour long videos of just Jillian screaming at contestants. Yeah, I'd watch that while working out, lol. I LOVE that you were honest about how you felt about the heat when you were overweight. I feel that exact same way. I do remember my hormones being crazy after my first one so I know that is a part of it, but I know that really a big part of it is that I'm overweight. I used to love summer but for years now I have hated it and it's because of how hot and sweaty I get and I'm just completely miserable. There are tons of reasons to lose weight but this is one that has really gotten me because it makes me embarrassed to sweat so much.